Over 200 visitors joined us on Saturday for a day of all things 1950s. Along with a display of previously-unseen 1950s clothing and artefacts, we showed some gems from our 50s cinema advert collection in a pop-up cinema and danced our bobby socks off with Swing Dance Leeds! 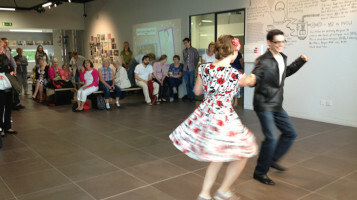 Visitors joined jive classes and learned some great moves, it was great to see people dancing throughout the day. We were thrilled to see some fab period outfits too, including vintage M&S dresses! Our photographer took lots of photos which we'll be sharing with you very soon. Watch this space!